1. Give us a call to check we are available. 01732 359643 or 07887 794782. 2. Please check that there is space at your venue for us to play -ten foot by ten foot square is generous for the quartet. We will be able to advise you if we have played at your venue before. The Trio and Duo require less space respectively. But please bear in mind that if there is not enough room for us to play we will not be able to play. 3. We ask for a deposit of £100 to confirm your booking. 4. A booking consists of consecutive hours, inclusive of breaks. We will play from the agreed time to begin playing until the agreed finish time. We need to take a short break (ten minutes) in every hour of playing – two breaks in a three hour booking. In a four or five hour booking one break will be longer. To keep your day running smoothly we are as flexible as possible over this: we will try to fit any breaks in with your schedule – during cake cutting, moving rooms, speeches, large group photos etc. In a two hour booking which includes a ceremony and moving rooms we will not need any break apart from the time required to ‘move’. 5. 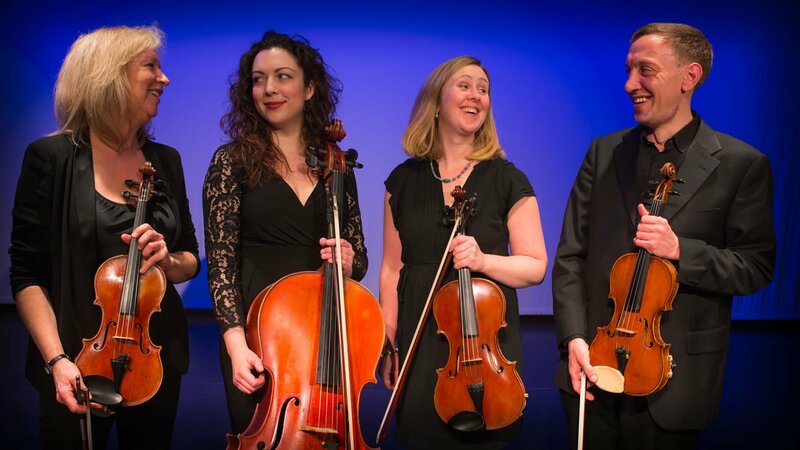 In the event of a quartet member being unavailable for your event we have an extensive pool of regular Haysden Quartet ‘extras’ – all professional players and friends who know our repertoire well; we guarantee to provide you with top quality musicians always. We have successfully coped with last minute emergencies over the years such as a car breakdown en route and being snowed in (thankfully rare events!) and have never let a client down. 6. We will arrive at least 30 minutes before your chosen start time to set up, check space and lighting & to talk through the ceremony (if applicable) with the registrar or minister. 7. Please may we have drinks available – mineral water preferably – and on bookings of four hours or more a round of sandwiches & a pot of tea is very welcome. 8. Your venue will have to provide us with four chairs without arms. 9. For summer events only: we can play outdoors only if there is sufficient shelter from direct sunlight which damages our old and valuable instruments. We cannot play outdoors if it is very windy, unseasonably cold or raining. 10. If you’d like a special piece of music played which is not listed in our repertoire please ask – I may already have it: or can arrange it specially for you for a fee. We can play just about anything if we can get hold of the music arranged for string quartet. 11. We will send you our ‘music questionnaire’ approximately two months before the day to help sort out details: this includes the invoice for the balance which we ask to be paid in full about three weeks before the date of performance. The fees below are just a guide, every event is different so please get in touch for your personalised quote.